It was time to leave Akureyri and return to the west, but this time we decided to go over the top of the pass rather than back around the coast. It had been snowing quite heavily for several days, so we were a little relieved to wake to blue skies. The snow-ploughs had done a good job, and we got over without any trouble. A few days ago, we tried to get to the geothermal pool at Grettislaug, where legend has it that the outlaw Grettir the Strong warmed up after swimming seven Arctic Ocean kilometres from the island of Drangey. On that occasion our map was incorrect and we ended up on the wrong side of the peninsula. This time we had better directions. 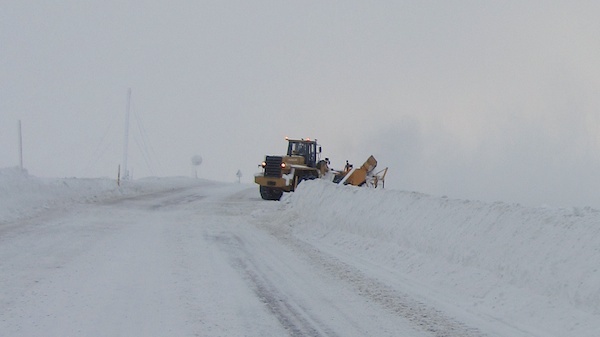 The last section is a minor road which was described as ‘icy but passable’. The road was indeed thick sheet ice, but the spiked tyres held their own. About two kilometres from the pool, there was a farm gate. 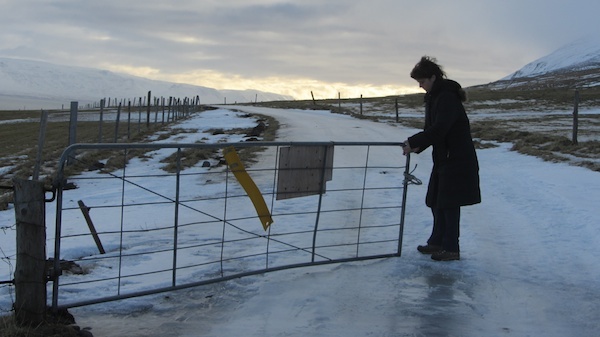 We got out to open it, and discovered that even though the car was doing tolerably well, we could barely stand on the slippery surface. Another half kilometre, and we could see the end of the road down by the sea shore. However, the ice was now stacked in transverse ridges and the car was starting to slide. I was confident that I could safely take us down to the shore, but less sure that I’d be able to get us back up the hill afterwards. For one of the very few times in my life, I chose the risk-averse option, and spun the car round to face back the way we’d come. The only way that we could go further was on foot. That was far easier said than done. It was impossible to even stand on the road without crampons, which we had neglected to pack. The fields on either side were also iced up, but occasional tufts of yellow hay projected through, and it was possible to very gingerly make progress. After a few hundred metres, we admitted that we’d never make it, certainly not without risking a certain bruising or worse. We turned round and carefully picked our way back to the car. Looking back at the car, which I’ve already turned round to face back up the road. This bit’s OK. I suppose I should have taken a picture of the road behind me! 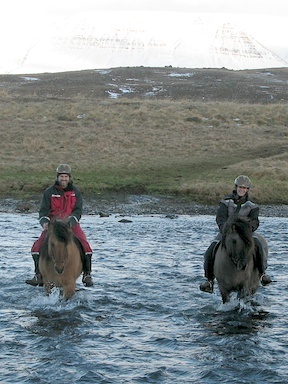 Emma from HestaSport had saddled up some horses for us in nearby Varmahlíð. The Icelandic horse, which resembles a Shetland pony, is the only breed of horse allowed in Iceland, having been introduced here around the 1000 years ago and kept pure ever since. The reason that the rules are so strict is that it is now the only breed of horse that naturally possesses five separate gaits. Elsewhere in the world, two have been lost, modern breeds being only able to trot, canter or gallop. Icelandic horses also have the tölt and the pace. The tölt is fast and yet comfortable because, since only one hoof is on the ground at any one time, there is virtually no up-and-down motion in the saddle. The pace is a very fast sprinting motion where the horse rocks from side to side with both left feet on the ground, then both right. The ground was icy here, too, but the horses had spiked winter shoes which made them sure-footed even on sheet ice. Emma told us that they are so good on ice that new riders often forget when they dismount, and end up sliding underneath the horse because they can’t stand up. Certainly these horses had no problem negotiating the icy, snowy, tussocky ground. On the way back to the stables, Emma showed us how to tölt, and we had some fun changing the pace up and down. It’s a really versatile gait, and you can genuinely just sit in the saddle and let it happen, it’s like floating on a cloud. Why can’t all horses do this? HestaSport also have some lovely little cottages on top of a nearby hill, and we had rented one for the night. Our little cabin has 360 degree views and is one of five clustered around a geothermal hot tub. After preparing dinner in our kitchen, we lazed under the stars in the 40 degree water and watched as the first slight haze of the northern lights appeared. There was a clear cold sky so we were hopeful of an auroral display later in the night, but it was too early yet for anything to happen. Much later, as I was penning this blog with all the lights off and the curtains open, a glimmer of movement caught the corner of my eye. At exactly eleven, a shimmering band of light spread out across half the sky. Streamers shifted abruptly back and forth, searchlights shone brightly into the heavens, and mysterious black bars of anti-light danced back and forth along the shining arc. Half an hour later, the lights went out and it was all over, but we felt privileged to have witnessed the display in this amazing place. This entry was posted in Europe, Iceland, Travel and tagged Horse Ride on 2014/02/09 by Reinhard.